Western Tussock Moth Caterpillar, Ojai, California. The Western Tussock Moth Caterpillar eats leaves and fruit, and it eats them from a lot of plants. And those beautiful long hairs can cause an allergic reaction too. Mine lasted a couple of days. 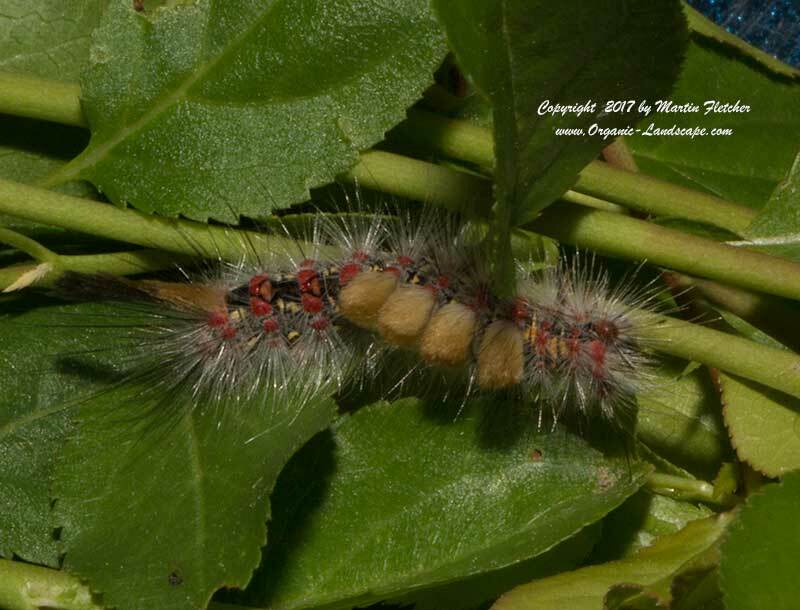 Western Tussock Moths Caterpillars eat Ceanothus, Oaks (Quercus), Apples, Citrus, Peaches, Roses, Buckwheat, Willow, Adenostoma, Manzanita, Pyracantha, Coffee Berry, and on this ornmental plum pictured here. There are one to two broods per year depending on how long the growing season is. Usually they are out by February and gone by June. The Western Tussock Moth Caterpillar can be an economic pest for nurseries and orchards.